Family & friends are invited to attend a visitation on Sunday, October 28th, from 10:00 a.m. to 12:00 p.m. (Noon) in the Vertuccio & Smith, Home for Funerals, 773 Broadway (Rte. 107) REVERE, for Loretta D. Lyons-Goldberg, who passed unexpectedly on Tuesday, October 23rd at the Winchester Hospital of Winchester, following a lengthy illness. 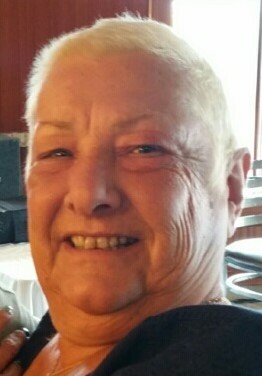 Her funeral will be conducted from the funeral home, following the visitation 12:15 p.m.
Born & raised in Revere, she was a 1974 alumna of Revere High School. She was also a graduate of the Blaine Institute for Hair Styling, Boston in 1977. Loretta spent almost 25 years in Everett, before moving to Stoneham, eight (8) years ago. She was the founder & operator of “Hair for All” Hair Salon of Wakefield for over 30 (thirty) years. She maintained a most successful business, until a debilitating illness forced her into an early retirement. Her salon was not only a place of business but was a gathering place for friends and those wishing to make friends. Loretta had a “larger than life” personality and once she met you, you had a friend forever & you were considered part of her “extended family”. The world is, and has been blessed by her presence, although, we all regret, the short-time our blessing enjoyed. She is the adored wife of Andrew S. Goldberg of 13 years. She is the devoted mother to Brittney Goldberg & Jillian A. Goldberg, both of Charlestown & J.T. Lyons & his fiancée, Julia Miller & Owen E. Lyons, all of Revere. J.T. & Owen were known to Loretta as “Her Boys”. Dear sister of John Lyons of Salem & the late Edward Lyons. She is also lovingly survived by her proud sisters-in-law, Pauline Marino-Lyons of Revere & April Etter of Tewksbury. She is the cherished niece to Lorraine Mastrorio of Wells, Maine & cousin to Robert Mastrorio of Revere. Sunday, October 28th from 10:00 a.m. to 12:00 p.m.
Andy and family our sincere condolences. There will never be a kinder more loving person than Loretta. She was the life of the party, sincere and was loyal to all. My whole family will miss her. She was always a part of our lives in good times and bad you could count on her smile, laughter and shoulder to cry on. Rest in peace we all miss and love you forever and ever. I cant say there was ever a moment with Lori that I didn’t have a smile on my face. Her presence was just radiating with joy and well jokes. I am so grateful I flew up, and spent the day with you. I am so grateful I got to tell you how much I loved you, and hug you that one last time. You will always be missed and loved, but never forgotten. R.I.P my Angel. Lori my friend, we’ve know you for more years than we can count. Your smile & infectious laugh will be missed. You loved with all your heart. Rest in Pease Lori. Both were talking Family and the old neighborhood. My unique, indefatigable niece Lori, my sister’s only daughter died from the effects of pancreatic cancer. Family, friends and fun were her mantra. Nearly every week for decades Lori called her old aunt. In one late phone conversation, clearly hurting from the oppression of cancer, Lori took time to assure me that she had accepted Christ as her personal Savior. Thus, I her godmother, rest in peace. You left us to early and left a hole in my heart. My sounding board & rock. Words can’t say how much i will miss you. My Thelma. You will be forever missed by all of us.